According to Moonalice legend, now that we have managed to avoid going to war in Syria, we need to find something for the Defense Department that is more productive than reading our email. 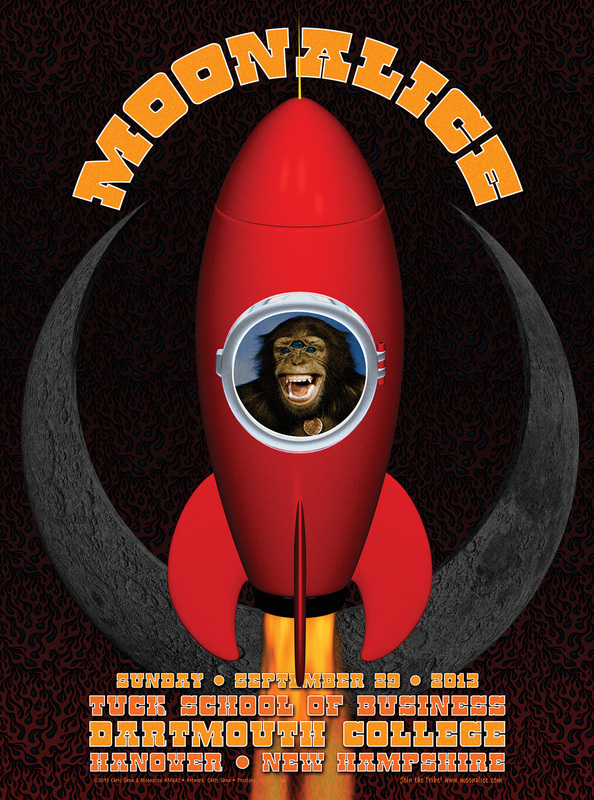 Sensing a window of opportunity, the Moonalice legend is moving to the present tense. One member of our tribe - Howling Monkey Moonalice - wants to exploit the debt ceiling conflict for tribal gain. Howling Monkey wants to send a three-eyed chimpanzee into space: himself. Howling Monkey is volunteering to fly a mission to our home plutoid, the moon. The chimp thinks Congress needs an alternative to delaying Obamacare forever, repealing all taxes and regulations, and forcing women to live as if this were the 14th century. And he thinks a chimp mission to the moon is just the ticket. Polls suggest the Chimp's plan lacks public support, but that won't stop him from holding the country hostage.
" Six days on the road " ... What a band you are ! Hopin' for a miracle from Tribe for this performance, if possible.